→Can Dogs Eat Red Peppers? Can Dogs Eat Red Peppers? The simple answer to the question "Can dogs eat red peppers?" is yes. Red Bell Peppers are an excellent source of essential vitamins, antioxidants, and fiber. Red peppers, whether prepared in a stew of meatballs, topped on your pizza, or diced in your salad is always a tasty addition to any dish. Yes, dogs can eat red peppers. Red Peppers contain little amounts of saturated fats and cholesterol and are very rich in Vitamin K, Vitamin A and a decent amount of dietary fiber. We understand that all dog lovers adore their furry friend and would not have for a second deny them a few goodies. However, hold on, just before you hand over some food with red pepper, there are a few things to note. 1 Can Dogs Eat Red Peppers? 2 What Are Red Peppers? 3 So, Can Dogs Really Eat Red Bell Peppers? 5 How About Cayenne Pepper? Red pepper can refer to any pepper that is red. Mostly this can either be the red bell pepper or the cayenne pepper. The red bell pepper is a variety of the sweet pepper. The sweet pepper, on the other hand, is a fleshy, tangy vegetable with a mild taste but strong flavor. Chilli pepper, on the other hand, is a small hot flavored vegetable with a strong smell. They can either be served whole, diced or in ground form. The ground powder is cayenne pepper. So, Can Dogs Really Eat Red Bell Peppers? Yes. If you feed your furry friend with small servings of red bell peppers every once in a while, then that is fine. It is actually advisable because these bell peppers are rich in essential vitamins and dietary fibers which are great for your dog’s health. Red bell peppers are more nutritious than green or yellow peppers. The most significant nutrient in these peppers is beta-carotene which the dog’s body can easily convert to vitamin A. This vitamin is an excellent booster for your animal friend’s vision. Another excellent bonus that comes with eating red bell peppers is that dogs have a plentiful supply of antioxidants. These antioxidants work to prevent damage to body cells and therefore improve the immune system. Aside from that, antioxidants help maintain healthy bones, coat the skin as well as the reproductive system. Other vitamins present in red bell peppers are Vitamins, E and C. Vitamin E gets used in dog shampoo to help maintain a healthy glossy coat. Aside from helping to improve the skin, this vitamin is also vital in developing the dog’s muscles and also healing in case of injuries. Vitamin C, on the other hand, helps dogs cope with physical stress because of injury or pregnancy. Red bell peppers have considerable amounts of this vitamin. However, you should not be too concerned about Vitamin C as dogs manufacture their own. Check out this article for more detail. You can grab some dried red bell pepper dices for your dog from Barry Farm on Amazon. Be careful with the amounts you give your dog, however. Too much red bell pepper and your dog will suffer from diarrhea or some forms of stomach upset which you will need the help of the a low protein dog food. 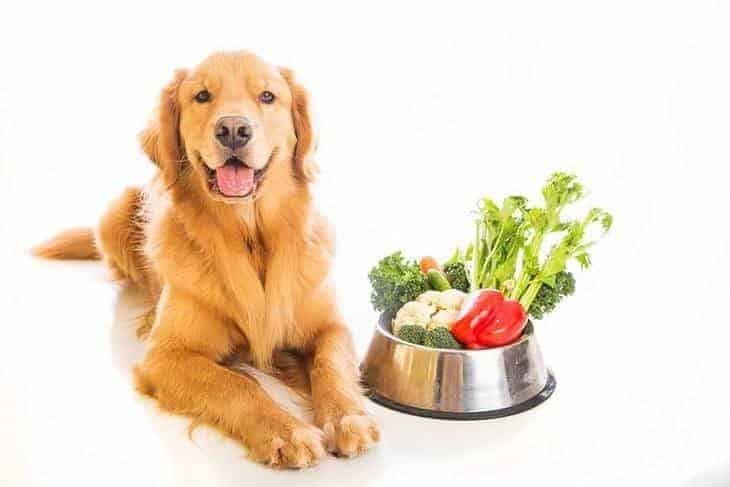 The dog’s digestive system is made to digest raw meat, and therefore you only need to give it moderate amounts of vegetables. Even though it is not toxic, dog specialists agree that cayenne powder is still harmful to dogs. Should it come into contact with the dog’s eye, nose areas or even its paws? It will result in a gradual but sharp burning sensation. Widening of blood vessels, commonly known as vasodilation. The result is an increase in blood flow around the body. The ‘warming up’ effect as a result of widened blood vessels can help dogs which suffer from poor circulation. Maybe this is the solution that your cold-footed puppy needs. When it comes to bleeding, cayenne does an incredible job of helping stop this. It can get applied in tiny quantities on the wound. It does not burn as much as swallowing it. It is a potent irritant which can affect the sensitive nose and eyes of your dog. You should avoid using this powder for dogs which have complications with their urinary systems, kidney or even a sensitive stomach. Spicing up your dog’s food in small quantities is still of benefit to your animal partner. Just make sure you understand your dog, it might or might not like it. The results of too much cayenne might be stomach upsets and pains or in the worst case, diarrhea. Dogs are also susceptible to internal burns in different areas of their digestive system, for instance, the intestines, stomach, and mouth. Well firstly that is awful, and we are sorry. If this has happened, you will have to call your veterinarian immediately. If possible let your dog have some water as it could help ease the pain it might be experiencing. We have seen the different types of red peppers and their importance to the life of our dogs. If given in moderate quantities, like green peppers, red bell peppers will provide the dog with many benefits such as lots of antioxidants and vitamins which are great for maintaining the immune system and healthy skin. Is it ok to give your puppy treats such as maple syrup, Cheetos or popcorn? Cayenne, on the other hand, helps improve blood flow. If you are still wondering, “Can dogs eat red peppers?”, Just know that in excess amounts, peppers could have unpleasant effects on your dog. Therefore, make sure you keep them away from the reach of your beloved animal. If you have any question or experiences that you would like to share with us, don’t hesitate to write us in the comments section. Otherwise, we hope the information will help you take better care of your dog. Can Dogs Eat Cheerios? What You Need To Know! Can Dogs Eat Greek Yogurt? What You Need to Know! Can Dogs Eat Maple Syrup? What you need to Know! Can Dogs Eat Avocados? Know These Things First! Can Dogs Eat Raw Steak? Is it Safe! Can Dogs Eat Eggs? What You Need to Know! I'm a self-employed blogger, life-long pet parent and lover of dogs and somehow manage to have time to pursue another of my passions - writing. I’m the primary contributor and editor of PUPPY FAQS. I love to write about the nutrition, health, and care of puppies. If you have a question that needs answering, please leave a comment below, and I will do my best to explain it. Some recommended products may use affiliate links. puppyfaqs.com is a participant in the Amazon Services LLC Associates Program, an affiliate advertising program designed to provide a means for sites to earn advertising fees by advertising and linking to Amazon.com. Amazon and the Amazon logo are trademarks of Amazon.com, Inc or its affiliates.